In Britain, the wedding season seems to start around June as couples attempt the tremendous task of trying to pick a day in the British summer that has the least likelihood of downpours. For their wedding, 27 years ago, my parents organised a reception which was held outside, in my grandparent’s back garden. It rained heavily before and after the party but, as luck would have it, during the festivities the sun came out in full force, as if to congratulate the happy couple itself. It always seemed unlikely that my parents would opt for a traditional English wedding fruit cake. Culturally, the family is a bit of an eclectic melting pot; whilst united by their Jewish culture, the origins of our family members range from Iraq, through to Burma and India, Russia, Newfoundland, Ukraine and, bizarrely enough, Wales. 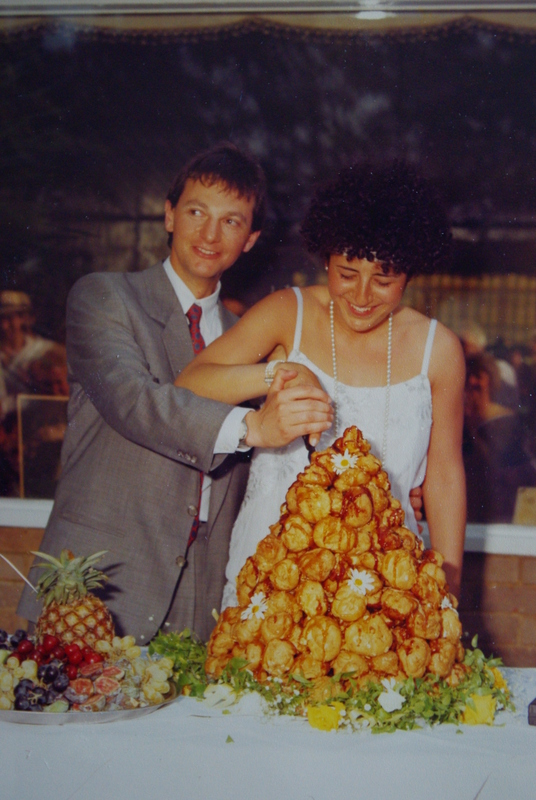 So to add yet another culture into the mix, my parents decided to go for a French wedding cake…a Croquembouche. I’ve always loved looking at pictures of that day. Besides the slightly shocking, yet amazing 80s hair and fashion, the photo of the wedding cake never ceases to take my breath away. It was made by a family friend – the incredibly talented Simone Ogus. In the picture below my parents are cutting the first slice of one of the biggest mountains of profiteroles I have ever seen! 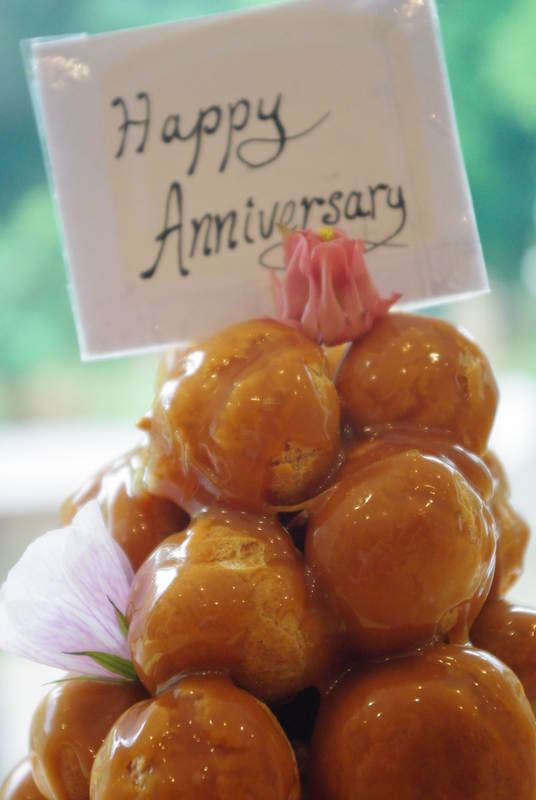 The croquembouche is the wedding cake of choice in France (although perfectly acceptable for all occasions I think) and is made up of lots of choux pastry profiteroles stuffed with copious amounts of crème patissière and held together with an abundance of caramel. When it came to my parent’s 27th anniversary this year, I decided to make a mini version of their wedding cake as a surprise. The version I made is about 20 times smaller, but still just as tasty (so I’ve been told)! Place butter, milk, water, sugar and salt in pan and bring to the boil. Lower temperature a bit and carry on beating for around 30 seconds to dry out the dough. Beat in eggs one at a time, beating until smooth. While paste is still warm, pipe small pieces onto a baking sheet lined with baking parchment. (remember they should puff up to about twice the size) If the tops are pointy you can press them down with a dampened finger. Bake for 20 mins and then whithout opening oven turn down the temperature to 180c /160c fan and bake for a further 15 -20 minutes until golden brown, puffed up, crispy and very dry. Let cool and then freeze empty if making ahead. In a pan, whisk sugar, corn flour, vanilla and milk until smooth and then whisk in the egg yolks. Put the pan over a medium heat add butter and bring to the boil, stir continuously and vigorously as it thickens to prevent lumps. Place mixture in bowl until cold and then chill. Beat in the cream until thick and smooth. Boil together sugar and water for 5 minutes until golden in colour. Simmer sugar, golden syrup and butter in a heavy based saucepan for 4 minutes, swirling to combine a few times and being careful not to burn. Add cream and salt and stir together. When a little cooler taste see if you want to add more salt. Cook for 1 more minute and then let cool. Place the cream filling into a piping bag with a small nozzle at the tip. Squeeze into profiteroles by piercing bottom or side with nozzle and piping filling inside. Make caramel. You will have to use this quickly as it will begin to set very soon. If it hardens in the pan too quickly, don’t worry, just wash out with hot water and make more caramel. Dip a small part of profiterole into caramel (preferably the covering the hole made by the piping nozzle to seal in filling) and “glue” to another profiterole. Continue using the caramel to stick them into a circular shaped base and then adding on top to make a tower shape. Put in fridge and take out about 20 mins before needed. 09 Jul	This entry was published on July 9, 2013 at 9:30 am. It’s filed under Food, Recipes and tagged Burma, Butter, Choux pastry, Cook, Croquembouche, Custard, Dan Lepard, Nigella Lawson, Profiterole, wedding cakes. Bookmark the permalink. Follow any comments here with the RSS feed for this post.